Kamares, Paphos - This lovely Kamares home is located at the end of a quiet road - a perfect setting for peace and quiet yet only minutes away from the Kamares club. 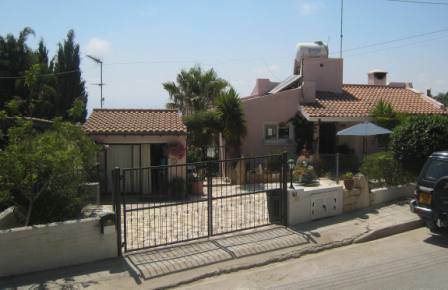 This 2 bedroom home with a large sunroom features spectacular views of the Paphos area and coastline. There is a large gated driveway and courtyard in front of the house with a large seperate room that is used as a laundry/utility and extra storage room. It can also easily be turned into a maids room. As you view this cozy home you immediately see and feel the special care and up-grades the owners have added. As you enter the foyer with a stone-faced archway that leads you into the living room with fireplace and two double sliding doors that take you out to the sunroom with it's spectacular views of the countryside down to the sea. To the left of the entrance is a modern and birght kitchen that is spacious with a movable island. There is also a large stone covered arched bar that looks into the dining and living room area. To the right are the main level w.c-toilet-shower and stairs leading to the lower level and the two bedrooms. The lower level consists of two double bedroom and family bathroom and a large covered extension to one of the bedrooms that can be converted into a 3rd bedroom. The bedrooms lead out to a large veranda with a whirlpool and BBQ area. There is also a large garden area with plenty of room for a pool.